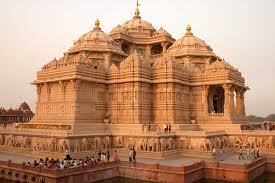 Here is some Information about Delhi Swaminarayan Akshardham The Hindu Temple. The monument is a fusion of several architectural styles of pink stone and pure white marble. Pink stone symbolizes bhakti (devotion) in eternal bloom and white marble of absolute purity and eternal peace. The monument was built after over 300 million man hours of services rendered by 11,000 volunteers, sadhus and artisans.It is the one of the wonders of the modern world, and the wonders of modern India. The Swaminarayan Akshardham complex was built in only five years through the blessings of HDH Pramukh Swami Maharaj of the Bochasanwasi Shri Akshar Purushottam Swaminarayan Sanstha (BAPS) and the colossal devotional efforts of 11,000 artisans and thousands of BAPS volunteers. Heralded by the Guinness World Record as the Worlda Largest Comprehensive Hindu Temple, the complex was inaugurated on 6 November, 2005. 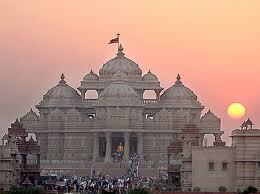 One of the most popular and amazing tourist attractions in the Indian nation is Akshardham temple. Known for its beauty and wide area Akshardham has several attributes that defines the existence and motive of human. 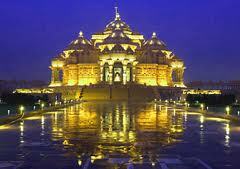 Destiny of humankind along with universe details comprises the history of Akshardham temple. Researchers do not call this place only as temple as it is the place of enlightenment, education and entertainment. 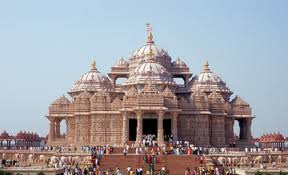 The entire area of Akshardham spreads over 23 acres and it includes parks, rides, lakes, sculptures and shrines flooded over the complete area of temple. All these things collectively describe the entire experience of India’s rich heritage and culture. Akshardham temple history devotes its existence to Lord Swaminarayan and has its inspiration from Pujya Pramukh Swami Maharaj. 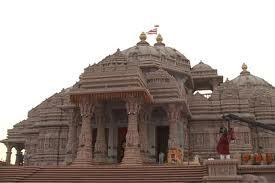 Thousands of people and volunteers have invested their money and service to establish this miraculous architecture of Akshardham that explores the rich culture of religion. The followers of Lord Swaminarayan work over here by spreading and enhancing the flavor of spirituality and devotion with complete peace of mind. This monument based on authentic and modern techniques present the perfect impression or imprint of Indian architecture with religious culture. 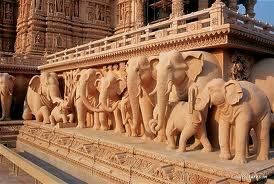 The architecture comprises of pink sandstone that comes from Rajasthan. More than thousands of these exclusive stones are carved with historical imprints that narrate the rich culture of India through pictures and carvings. The artists and builders have not used cement or metals like steel so that monument lives for years to come. The history of Akshardham temple suggests that there are about 93 pillars that are sculpted and more than 40 windows having carving from either sides that allows patterns to look outstanding. The carving done on pillars and the walls of temple are actually poetic and looks wonderful in narrating the aura of devotion towards the culture. 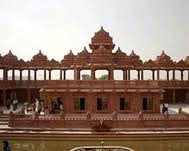 This particular temple has its name in the book of records in world, Guinness and it includes all the basic amenities and features that allow offering a prayer. 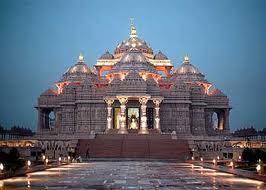 Akshardham Temple history is available on stores and internet for the people having interest in this religious monument. The temple does not ask you to follow particular God rather it just asks people to pray their mentor or teacher that is to whom they owe their existence. All these theories by Lord Swaminarayan were compiled together and the place called Akshardham came in to origin. People here come to practice self-peace of mind and soul as per historical aim of this temple. There are as many as 234 pillars, exquisite carvings on pavilions, floral motifs, and arches, ornate domes which are 9 in number and have as many as 20 shikhars which are quadrangle in shape. 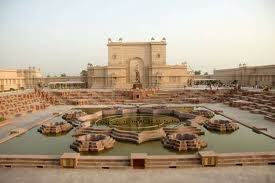 AksharDham Mandir in the capital city has 20, 000 statues. These statues are of the eminent devotees, acharyas, and sadhus of divine personality. 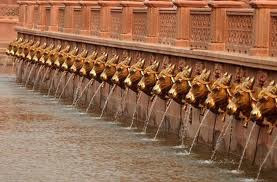 To add to the beauty of the temple, you will also find musical fountain, a theater, and the Swaminarayan temple. The ambience of the temple is amazing. 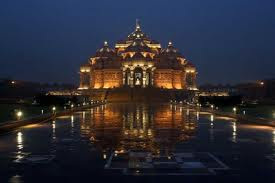 When you travel to Delhi and visit the Akshardham temple, the architectural delights will just keep you awed. Lord Swaminarayan’s statue adorns the main shrine of the mandir. Nilkanth Varni Abhishek at Akshardham Swaminarayan Temple with the water of 151 holy rivers,lakes and ponds of India.The main temple was Made of pink stones and white marble also built without the use of steel. Decorated with domes, carved pillars and 20,000 murtis.Sixty acres of lush lawns, gardens and exquisite bronze statues who inspire values and character. Hall of Values (Sahajanand Pradarshan): Experience enduring human values through films. The audio-animations show conveys the messages of wisdom and the true meaning of living life by practicing.Each statue appears so real. Giant Screen Film (Neelkanth Yatra): Discover India through the incredible story of an eleven-year-old yogi named Nilkanth that brings to life the culture and spirituality of India's customs and The film revolves around a child yogi, Neelkanth Varni. The screen is over six stories high. 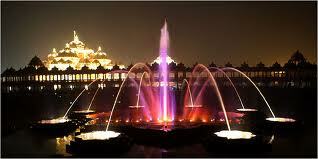 Boat Ride (Sanskruti Vihar): One should not miss the boat ride when in Akshardham. see the world’s first university of Takshashila, sail through the caves of Ajanta-Ellora and discover India's contributions to humanity through the ages. Musical Fountains (Yagnapurush Kund): The musical fountain show is held in the evening and showcases the interdependency between God, nature and man.A spectacular musical fountain show that depicts the cycle of birth and death and life as described in Indian philosophy. Its is an extraordinary experience! Garden of India (Bharat Upvan): A lotus-shaped garden echoing spirituality as expressed by philosophers, scientists, and leaders throughout history. From NewDelhi Railway Station :Akshardham is about 10 km from here.You should come out of the Railway station from Platform No.12 Side ( Not by Platform NO.1) ; About Rs.100 by Auto Rickshaw.